A sterling silver flower petal necklace. When I created this piece, I was looking for something understated yet undeniably pretty and could be worn to work everyday. The petal necklace has now become my signature piece, and I wear it everyday and everywhere. I'm really proud of this design which is both modern and classically beautiful. I promise it will become your statement piece too. Each silver petal is carefully hand pierced and hammer forged by me to create the gentle curves and subtle lines of a fresh flower petal. 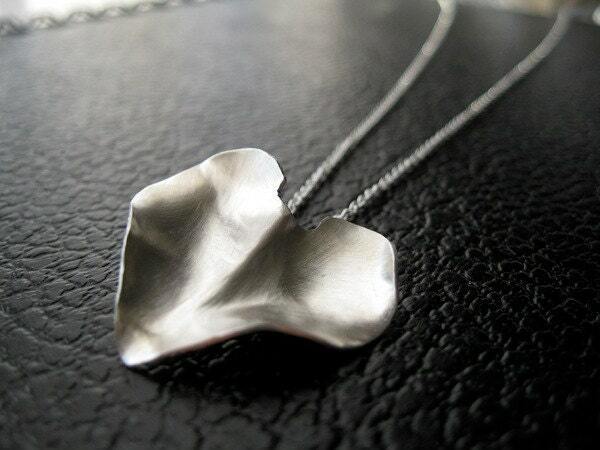 The petal is about 1” in height and 1” at its widest and made from reclaimed sterling silver. This necklace comes with a 20" sterling silver chain.